Horseshoe crabs are also known as Xiphosura. From the Cambrian to the Permian they were numerous, but today only four species survive, and these are practically unchanged from those found in the Triassic. 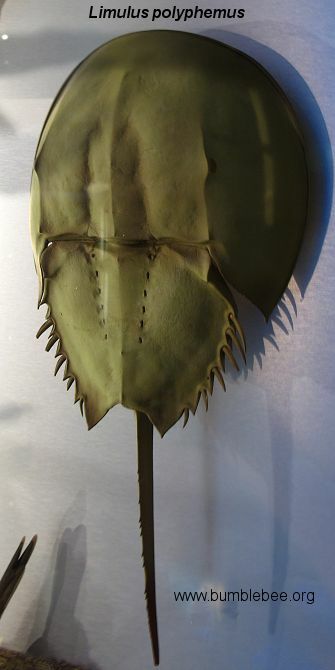 However the fossil record of the Atlantic horseshoe crab stretches back just 20 million years. Horseshoe crabs are relatively large and grow up to 50 cm long. Females are larger than males. They have a thick horseshoe-shaped carapace covering the prosoma and hiding the legs, and a long tail/telson ending in a spine. The pedipalps and first three pairs of legs are chelate (end in pincers). They breathe through external gills and have a pair of dorsal compound eyes as well as a pair of simple eyes, they have photo-receptors in their tail spikes. The larvae resemble trilobites. They usually inhabit shallow waters and feed at night on worms, mussels and other small molluscs. Below is Tachypleus tridentatus, which is found in the Indo-Pacific. In the mating season horseshoe crabs mate on the shore at high tide. The female digs a burrow in the sand and lays her eggs. The males approach the burrow and add their sperm to the eggs. More than one male may creep up behind the female to add his sperm. The eggs are then covered, and in this position are protected from the waves and warmed by the sun. The larvae hatch at high tide. Limulus polyphemus, above, is found in the Gulf of Mexico and along the northern Atlantic coast of north America. Down to 30 m deep in sand and mud. Females are larger than males, and can be up to 60 cm long (including the telson). They also have the unusual ability to regrow lost limbs. The telson, or tail is used to steer the animal through the water, and also to flip it upright if it is upside down. It has two large compound eyes, five simple eyes on it carapace, and 2 simple eyes on its underside, near its mouth. The telson also has light-sensing organs along its length. Horseshoe crabs spawn in late spring. Gentle, sloping sandy beeches are needed for breeding. The females lay their eggs in the sand at high tide, in a nest about 20 cm deep. Between 15,000 and 60,000 eggs are laid, the amount depends mainly on the size of the female. Males are sexually mature at around 10 years of age, and females at around 11. The life span is not known, but is thought to be 20 - 40 years. 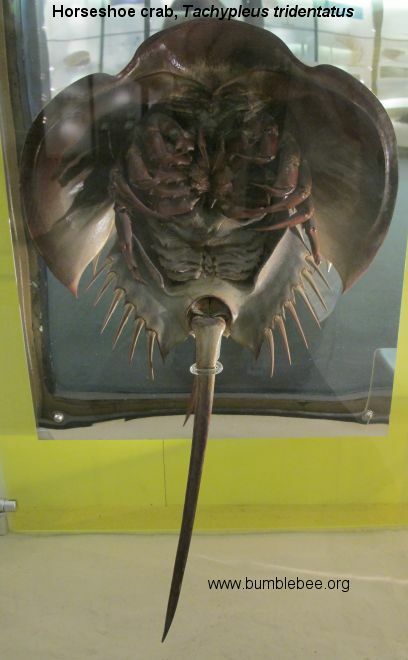 The horseshoe crab feeds on molluscs and annelids. The backs of older species can be colonised by a range of other animals including flat worms, molluscs, barnacles and bryozoans. Horseshoe crabs blood is blue when exposed to air as it contains hemocyanin - a copper containing protein, whereas out blood is red when exposed to air as it contains hemoglobin - an iron containing protein. The blood is widely used in medicine to detect bacterial diseases, and enzymes from the blood are used in the International Space Station to test for bacteria and fungi. The horseshoe crabs are not killed for this blood. Rather like human blood donors, a small amount is taken, and the crabs are released back into the sea. About 98,000 species have been described so far, but there are thought to be as many as one million mites awaiting discovery. And 1m3 of soil may contain more than 1,000,000 mites. Arachnids have 6 pairs of appendages - 4 pairs of legs, 1 pair of fangs (chelicerae) and 1 pair of palps. Most are predators and their chelicerae and pedipalps often have fangs (see the Tarantula with a bird on the left); they may also have poison glands and stings. For more details click on the links above. The Arachnids take their name from Arachne, a counrty girl who was a talented spinner and weaver. For the full story see Wikipedia. These are found amongst litter, on bark and even on the sea shore. Most are just a few millimetres long; with a size range of 0.7 - 12.0 mm, and they resemble scorpions except that they do not have a tail. They are found world wide, and there are over 3380 described species, and 27 in Britain. Some have 4 eyes, some 2 and some are eyeless. The eyes are simple, and are able to detect light and dark only. They have poison glands in their relatively huge pedipalps (claws). They feed on other small animals, e.g. collembola and mites, poisoning their victim to kill it. Before each moult a silken nest is built for security and protection. A silken nest is also built in cold climates for overwintering. They are most often seen by us when we find them clamped on to the leg of another animal, such as a harvestman or a fly. What they are doing is hitching a ride to a new location. This is called phoresy. Maturity can take 1 - 2 years, and their life span is 2 - 5 years. Courtship and mating is varied, complex and depends on the species. The female lays her eggs either in a silk nest where she remains, or she carries them around with her on her body.